"Lead Guitar and vocals:- A brilliant guitarist who is rated as one of the outstanding musicians in East Anglia, Philip is a dark handsome lad of Greek parentage." 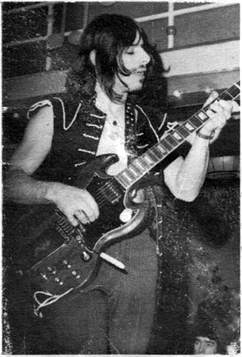 Phil joined us when Ronnie Dearing decided to leave the group in April 1967, and was there until the end in March 1971. We all loved Ronnie, but Dimitri turned out to be a worthy successor. Very different in playing style, he soon proved to be a real find and his contribution went way beyond guitar playing. His song writing abilities changed the direction of the band and enabled us to stand out from other local groups. By the time we split up, Dimitri had become a legend in East Anglia and beyond, and he continued playing at a very high level after Eyes of Blond split. He had two further bands - Dimitri and Sun - before he finally stopped playing in the late 70s. It was his idea to have a "get together" to perform "a couple of songs" in Eastbourne in 2014, which led to our playing half a dozen songs all written by him. Very enjoyable. With encouragement from David Clayton (Editor, BBC Radio Norfolk) we rehearsed hard to prepare for a one-off gig at the end of January 2015 and Dimitri wrote a perfect song - Stepping Back In Time - specially for the gig. This was very well received by the great audience we had, and we then went on to record it at the end of 2016. 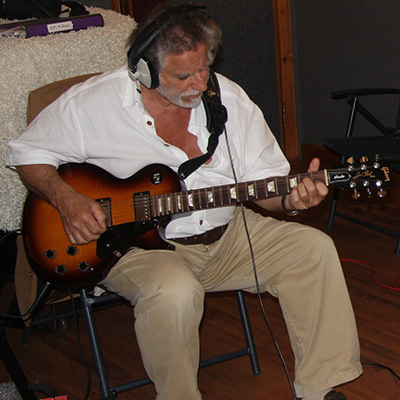 Dimitri recording "Steppin' Back In Time"
This is the guitar Dimitri had been using in the Audio B Band and he used it at his audition to join Eyes of Blond. ... Phil Wade had been using a Tele since Circuit 5. Dimitri tried it, liked it, and bought his own. Gibson SG Standard ... Dimitri changed again to the guitar he would use for the rest of the life of the band. Together with Selmer and Gibson wah-wah pedals, coupled with a re-housed Jen fuzz box, he could now get quite astounding sounds with incredible sustain and harmonics. Jan 2015 Gig ... after scouring the web for a suitable instrument that didn't break the bank, Dimitri plumped for this model. When fitted with a Telecaster neck pickup it produced a reasonable sound, but was a devil to play. Dimitri had borrowed a Les Paul copy for the Eastbourne gig, and really liked it. We were blown away when he turned up at the first rehearsal for the Jan. 2015 gig with this beauty. He had tried an SG, similar to the one he played in the 60s, but much preferred this Les Paul. It didn't let him down.